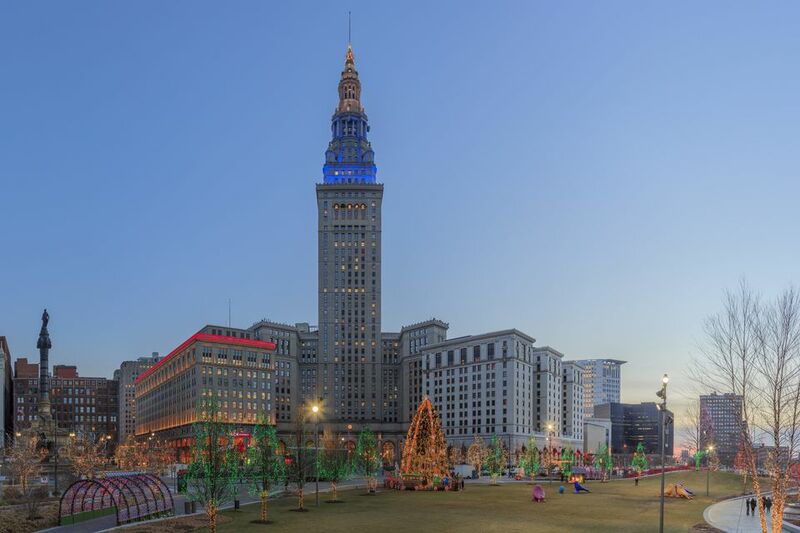 From downtown Cleveland's Public Square to Nela Park and Shaker Square, Northeast Ohio offers a wide range of festive holiday light displays throughout the winter season, and depending on where you want to go in Northeast Ohio this time of year, you and your family can enjoy some of these seasonal delights. Typically starting around the Thanksgiving holiday and continuing through New Years Day (or later), these special holiday events light up Northeast Ohio and provide visitors opportunities to meet Santa, ice skate, or explore a winter wonderland full of lights and art displays. Whether you're in Cleveland, Akron, or any of the surrounding cities, there's certainly something to check out to get you and your family in the Christmas spirit. Check out the following sections and plan your winter vacation to Northeast Ohio, complete with some of the best Christmas attractions in the region. Perhaps one of the biggest draws of the Cleveland area for holiday cheer is the lighting display, Winterfest, and public skating rink at the Cleveland Public Square. Starting on November 24 with the official season opener of the Cleveland Foundation Ice Skating Rink, the Public Square offers guests a plethora of winter fun, shopping, and dining options. Winterfest, which takes place on November 24, 2018, offers visitors free carriage rides, a tree-lighting ceremony, and even a fireworks show to kick off the Christmas season, and guests can browse the wares of pop-up retailers inside Tower City make up the seasonal Cleveland Bazaar, which features crafts, activities, Jack Frost Donuts, and Great Lakes Cheese in the Kids Village. At Lake Farmpark in Cleveland, you can check out the annual Country Lights, November 24 through December 3, where you and your family can enjoy a horse-drawn wagon ride through the park, trimmed with hundreds of thousands of lights and visit Santa's workshop. Tickets must be purchased in advance and often sell out, so be sure to get your tickets soon if you hope to make it this year! Nela Park also offers guests a chance to see a Cleveland holiday tradition since 1925, where the GE facility at Nela Park puts up hundreds of thousands of lights along the Noble Road perimeter of their grounds each year, beginning in early December and lasting until New Years Day. Nela Park also manufactures the lights for the National Christmas Tree in the nation's capital, so if you only have time to see one light display this season, this is the one to visit. You can also check out the Cleveland Museum of Art's annual Winter Lantern Festival, which features "Environment of Lights" displays around Wade Oval, plus lantern displays at the Museum itself and takes place starting on December 2, 2018. If you're not going to be in the city of Cleveland itself this holiday season, the smaller towns and cities of the region still offer a plethora of winter events and special activities—from Karon's lighting displays to the Festival of Lights in Huron. Medina County Fair Holiday Fantasy is a weekend drive-through adventure with over 85 lighting displays that are available from November 24 through December 25. Located at the Medina County Fairgrounds at 710 West Smith Road, this display is the largest in the area (even bigger than Cleveland's! ), so your family is sure to enjoy this trip for the spectacle alone, but if you're in Huron, consider checking out the Firelands Festival of Lights, which is like a smaller version of the Medina County Fair Holiday Fantasy that runs from November 24 through December 31. In Akron, you can visit the historic Stan Hywet Hall and its annual "Deck the Hall" celebration, where the estate is surrounded by more than 200,000-holiday lights which are turned on for select evenings from November 24 through December 30 from 5 to 8 p.m. This tour provides guest not only a brilliant lighting display but also a glimpse into what life was like in a Northeast Ohio manor house during the early 20th century. Also in Akron is the city's Holiday Fest Lighting Spectacular at Lock 3 Park, which kicks off on November 24 with the lighting ceremony for the Christmas tree and park, complete with a choir performance and ice skating after the show. For the rest of the season, from November 25 through February of 2019, the park will remain open and features a whole list of weekend programming throughout the season.